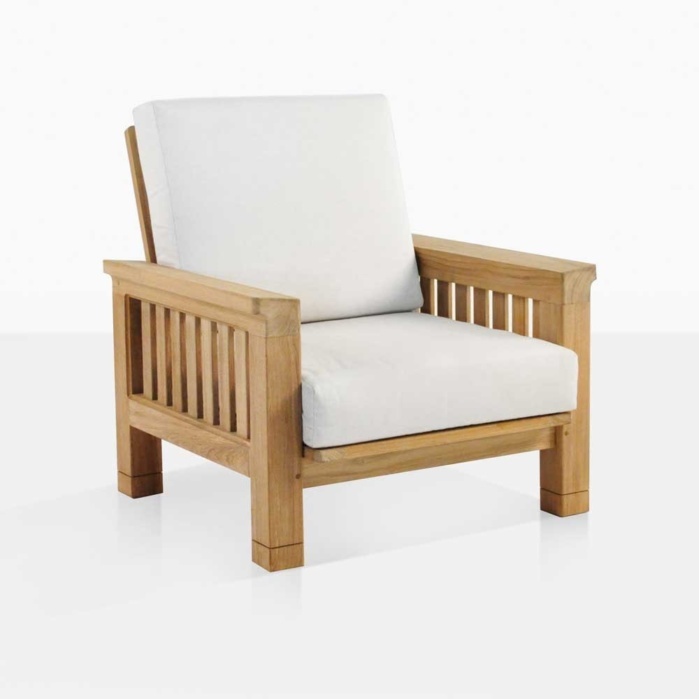 The Teak Outdoor Club Chair in the Raffles collection is the definitive Teak Outdoor Club Chair. It is built with room to relax and is made to an exacting set of standards that denote the highest level of comfort as well as practicality. While it is a legacy piece of furniture, the Raffles Outdoor Lounge chair is also an oasis of comfort and stability located under the veranda in your garden. This is the type of furniture that becomes timeless because the design and look and the construction and the materials are so robust and desirable. 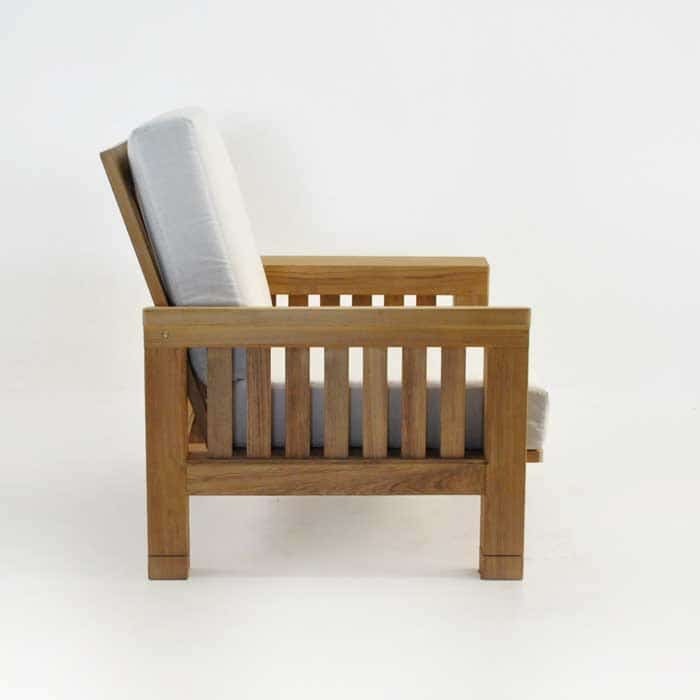 The teak sourced for the manufacture of the Raffles Outdoor Lounge chair is testament to this timeless and substantial attitude. The generous pieces of teak are the highlight of the chair’s build. The style is some plantation and colonial, with a decidedly modern edge. 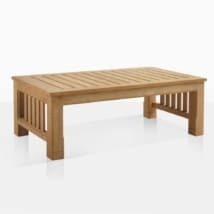 W34" x D36" x H38"
The wood used on the majority of the frame for the Raffles Teak Outdoor Furniture Collection is finished to over 3 and ¼ inches in width, square. The wood used to form the prodigious arm pieces start at over 4 and ½ Inches Square. You can see this hard to source Grade-A teak in the finished products throughout the Raffles Collection. 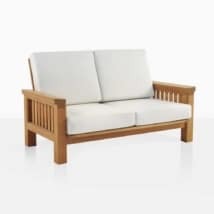 It is put on center stage in the Outdoor Lounge Chair, as the amount of teak with this large sizing is prominently on display in a relatively small form factor. Simply put, this is a stout piece of furniture that captures the eyes with elegant lines. While the footprint isn’t huge, this Outdoor Lounge chair is made for comfort. The angles and edges are all tailored to give a smooth and inviting feel. The Sunbrella® cushions are also built to provide this high level of comfort. The seat depth is 24 inches on cushion, with 24 inches of seat height. 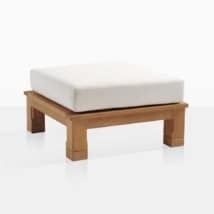 The distance from floor to top of seating cushion is 16 inches, which allows you to get up from the Outdoor Club Chair with ease and relax without sinking too far into the seating area. 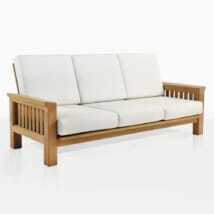 The wide veranda style slats of teak provide a strong and interesting architecture that is both simple and impressive. These boards can be seen on the vertical elements of the chair. This piece of outdoor furniture is permanent looking without being clunky. The weight of the piece is further evidence of its quality and the longevity of the style and look. 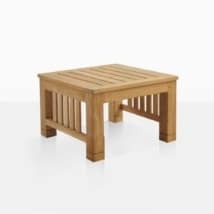 This is the type of piece you put in your garden on stone flooring or under the pergola or veranda, when you’ve found the perfect perspective to view your estate or grounds. As grand as it is, the versatility of the Raffles pieces is that they are at home in many backyards and patios, whatever your space, grandiose or petit. 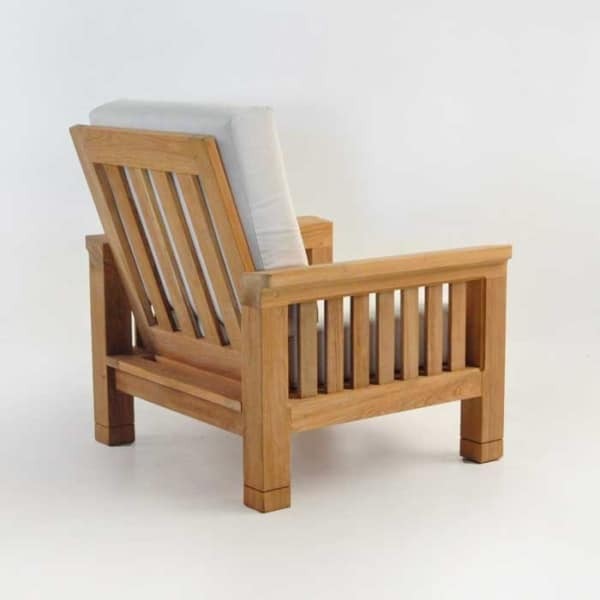 The outdoors is a perfect space for this classic plantation style Outdoor Lounge Chair.